Joe’s Own Editor is a Terminal text editor, popular in old school Linux and Unix distributions, which can mimic the feel of other popular editors like emacs and WordStar. While JOE is an oldschool Terminal editor, it has powerful features. It can find and replace words in multiple file batches, edit hexadecimal code, unlimited undo and redo, highlight code syntax, respond to emails, and has many other functions. Works with my iPhone 4, had issues with my 3rd generation iPad. JOE – Text Editor is a port of Joe’s Own Editor to the iPhone. I should note that I can’t get Joe’s Own editor to run directly off my third generation iPad, but I am able to remotely access the editor off my iPhone 4 (as a server) from my iPad (as a client) through SSH. Since MobileTerminal isn’t compatible with the control or arrow keys on my Bluetooth keyboard, usability with the default key bindings are limited. It is possible to access the control options through the bullet symbol (•) on the iPhone’s virtual keyboard, but this is not a comfortable way to move the cursor around. You wouldn’t want to press three buttons every time you wanted to move the cursor one space to the left. That said, JOE is an extremely powerful text editor and would be extremely useful for coding and development… if proper support for the control key could be implemented. As of right now, it’s just an example of what could be done with MobileTerminal on the iPhone. Working example of JOE on my iPhone 4. 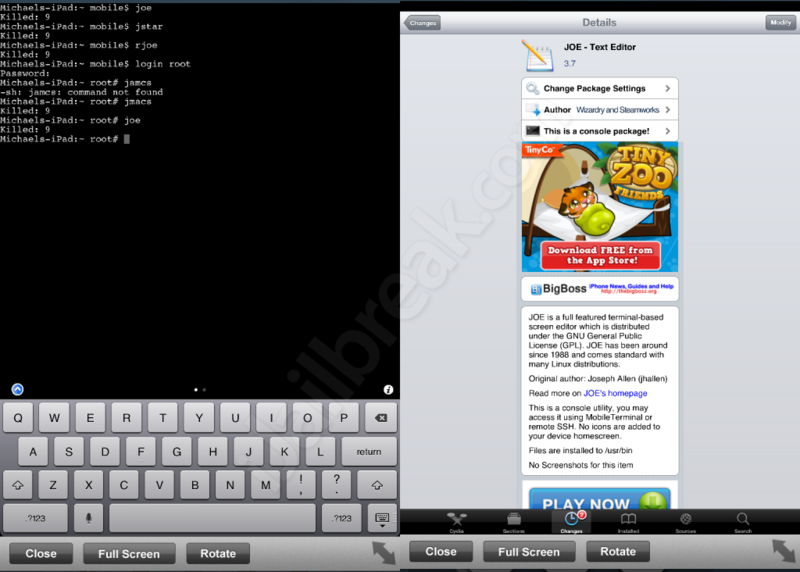 JOE – Text Editor can be found on Cydia through the BigBoss repository. JOE is free and is licensed under the GNU. It doesn’t create an icon on the desktop; instead you have to execute JOE from the Terminal. “joe” brings up the default editor, “jmacs’ is a clone of emacs, and “jstar” copies WordStar. Would you like to see a more functional version of JOE on the iPhone? (Maybe with a more suitable front-end than MobileTerminal.) Share your thoughts in the comments section below. emacs on iOS is available, but it is heavily dependent on the control keys too. MobileTerminal would be the killer app if there were a way to make use of the full keyboard. I hate apple and their cripple-ware.